Interconnects are a fundamental part of any system; the connections used between the different pieces of equipment are critical to overall sound quality. Cabling is often overlooked as a source for potential upgrade and a way of getting the most of your existing system. Due to the differences in many manufacturers’ terminations, interconnects come in many different variants including RCA (phono), BNC, DIN or XLR terminations. For information about The Chord Sarum interconnect, please visit the Chord Sarum page. Because of the sheer number of interconnects we stock here at Cymbiosis, it would not be possible to provide in-depth details about each individual one. Here we have provided information on our three most popular interconnects, but for more advice and information about the full range of interconnect cables we can supply, please contact the shop directly. We will certainly be able to advise you on the absolute best cabling solution for your system and budget. The Indigo Tuned ARAY is an all-new cable design featuring new conductors and improved shielding, but most importantly, Tuned ARAY conductor configuration. The improvements that Tuned ARAY conductors bring, combined with a more effective shield and better conductors, makes the Indigo Tuned ARAY a truly excellent cable. It combines outstanding levels of detail with the extraordinary musical coherence that Tuned ARAY technology brings. Chord Indigo Tuned ARAY analogue interconnects all use the same unique conductor formation developed for Chord’s flagship Sarum Tuned ARAY interconnects. 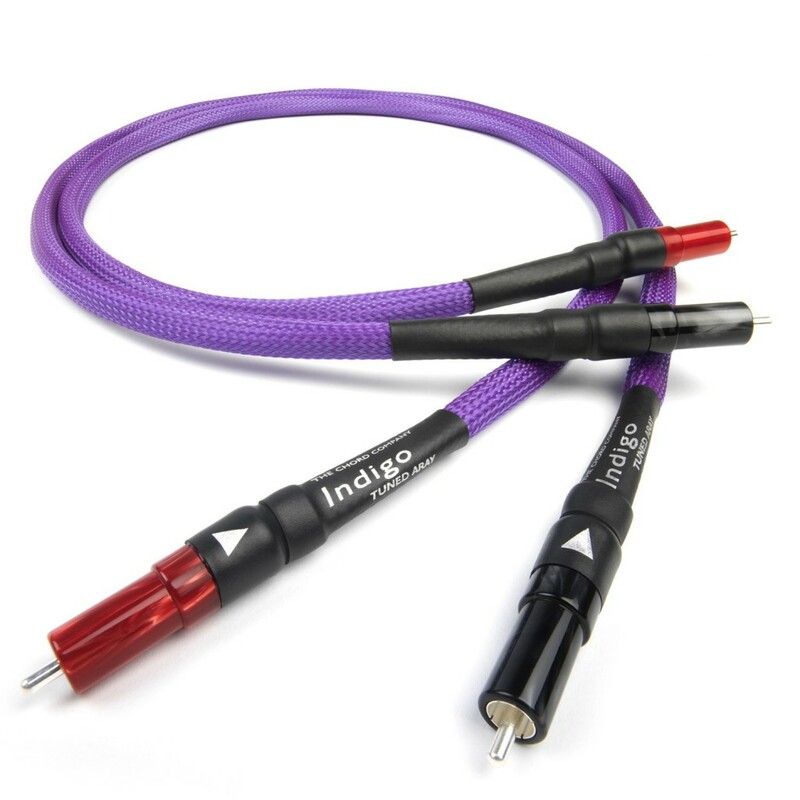 Each Indigo conductor is built using heavy-gauge, high quality silver-plated conductors. Insulation is PTFE and the conductors are shielded with two layers of very high-density silver-plated braid that is effective over an extremely wide frequency range. The shielding is covered with a white PTFE precision applied outer extrusion. Like Sarum, Indigo Tuned ARAY cable is produced to extremely tight tolerances. Indigo Tuned ARAY builds on the extremely transparent and coherent performance of the Signature Tuned ARAY, with the higher density shielding and heavier gauge conductors used in the Indigo improving detail and dynamic performance still further. The Signature Tuned ARAY replaces the Signature Plus and is a completely new design, with all the wonderful timing and coherence that comes from using Tuned ARAY technology – the same unique conductor formation developed for Chord’s flagship Sarum Tuned ARAY interconnects. Each Signature conductor is built using high quality silver-plated conductors. Insulation is PTFE and the shielding consists of two layers of high-density silver-plated braid that is effective over a very wide frequency range. The shielding is covered with a white PTFE precision-applied outer extrusion. The Signature cable is fitted with Chord’s ultra low mass RCA plugs in which the silver-plated centre pin is set into a PTFE insulation block. A low mass silver-plated shield/return connector is fitted and a PTFE layer applied, before the precision-machined, vibration- damping acrylic plug casing is fitted. The acrylic plug surrounds are individually machined for Chord by a British company that specialises in high-precision acrylic parts for use in the medical industry. This total dedication to detail results in a cable of superb quality and capability. During the development of the CD555, a special project ran in parallel to develop a new signal cable that would exceed the performance of Naim’s standard cable. The brief was to investigate all parameters of a signal carrier, to improve the whole rather than just improve the cable as would be the more normal development practice. Given the opportunity to start with a ‘clean sheet’, Naim’s R&D team decided to develop a much improved and de-coupled plug as well as a new cable. The results are exceptional when the cable is allowed to hang loose and free. Highly recommended for use with Naim equipment, the Hi-Line is available in the following variants: 5 pin DIN to 5 pin DIN, 4 pin DIN to 5 pin DIN, 5 pin DIN to 2 RCA, 2 RCA to 5 pin DIN and 2 RCA to 2 RCA. The Hi-Line project ran alongside Naim’s Power-Line mains cable project and both produce exceptional results in comparison to the standard interconnects and power cables. The Hi-Line comes as standard with some of the higher-level Naim equipment.